Do you want to learn an SEO strategy that works? SEO where you can build authoritative links that will catapult you to the top of the SERPs, without risk of a Google slap or penalty? I'm talking a pure White-Hat SEO strategy where you can sleep at night, and build traffic-busting websites. In 2017, how many SEOs can offer that type of search engine optimization? This book can! Google is on the SEO warpath. Anyone caught breaking the rules or trying to manipulate their own rankings through aggressive SEO techniques, will find their website dropping out of the top 10, top 100, or even out of the search results altogether. Search engine optimization can now kill your rankings! Google released a whole menagerie of animals (Panda, Penguin, Pigeon, etc) on unsuspecting webmasters, but also employs humans to rate content. You cannot fly under the radar any more. Gone are the days of fast rankings with SEO loopholes. Today, SEO can be very dangerous if you follow the wrong advice, and most SEO advice you read for free online is very wrong. Most search engine optimization advice is out of date, or written by someone that has never really tested their own theories. I've been testing for over a decade. SEO 2017 & Beyond is a book that will teach you the safe, white-hat search engine optimization strategies I personally use to get my web pages (and those of my clients) to rank high in Google. This is battle-tested, white hat SEO that I've learned, developed and tested over the last decade. On-site optimization techniques that I was teaching my newsletter readers back in 2008, is only now becoming mainstream in SEO. I play by Google's rules, meaning I never have to wake up after a major update and wonder if my sites have been hit. I am always looking forward and asking myself what Google wants, and how I can deliver. With so many algorithm changes taking place at Google, you might be wondering how it is possible to stay up to date with all the changes. The good news is that it is easy once you acquire the right mindset. Understand what Google is trying to do, and give it to them. This book teaches you that type of search engine optimization. You will not find any strategies to beat the system. You will not find any loopholes to beat Google. You WILL find solid strategies, solutions & advice to create great content and build high authority links and domain authority. You won't be learning any black hat SEO backlinking techniques. These would only serve to get your site penalized. I only want to teach you a "future-proofed" strategy. You'll learn the truth about anchor text links and why everything changed when Penguin was released. You'll also learn what makes a backlink valuable in Google's eye, and what makes a backlink spammy. I'll tell you about the Holy Grail of backlinks, and how to get them for your site. They take more work, but a few of these links are priceless when it comes to ranking. You'll also learn why it is important to focus on building your site authority. I'll go through some of the older backlinking techniques and mention any that still have value. Most don't. The good news is you don't need to use those techniques. I'll show you how the high domain authority sites build natural, high impact links. This book is now in it's 6th major edition - SEO 2017. In it, you also get the comprehensive SEO Checklist (the same checklist that is available as a standalone book on Amazon). Use it to find and fix SEO problems on your site, and reverse Google penalties. 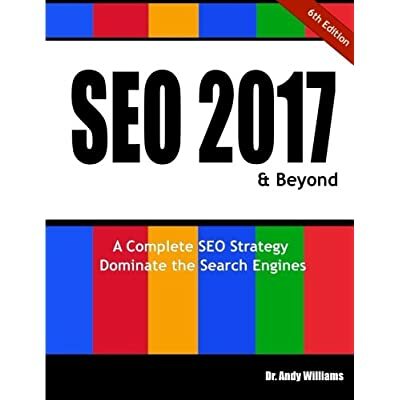 SEO 2017 & Beyond was written by search engine veteran Andy Williams of ezSEONews.com. He has been teaching this stuff since 2003, in his free weekly newsletter. If you want to understand what the search engines want, and learn modern search engine optimization that gets higher rankings through great content and smart backlinking, explode your traffic AND have Google's blessing, then you should read this book.